Ontological engineering is a methodology that proposes various processes for constructing ontologies (Corcho, Fernández-López, & Gómez- Pérez, 2006; Davies, Fensel, & Harmelen, 2003; Dietz, 2006; Gaševic, Djuric, & Devedžic, 2006; Gómez-Pérez, Fernández-López, & Corcho, 2003; T. Gruber, 1993; Guarino, 1997; Horridge, Knub lauch, Rector, Stevens, & Wroe, 2004; Uschold & Gruninger, 1996). Such a process begins with a knowledge elicitation step for the target domain based on the services that the ontology is expected to provide. This step allows for the identification and structuring of the domain’s knowledge through documentation and consultation with experts. The next step involves the formalization of knowledge into an ontology. 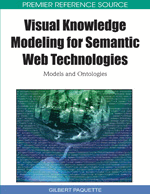 Ontologies can afterwards be processed by software agents using inference engines to deduce facts that were not provided by constructor of the model. The final step, validation, ensures that the ontology is effective in accounting for all useful knowledge needed to satisfy the original objectives.